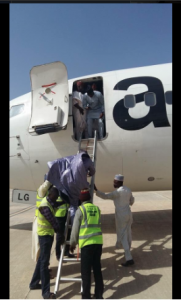 Aero Contractors Airlines has been penalised for allowing its passengers disembark from an aircraft with the use of a ladder. The Nigerian Civil Aviation Authority has imposed an applicable sanction on Aero Contractors in line with Nigerian Civil Aviation Regulations. According to Sam Adurogboye, Acting General Manager, Public Relations of NCAA released a statement on Tuesday, stating that Aero Contractors would pay a fine running into millions of naira.